Christmas is almost here, only two more weeks. Wow I can’t even believe it. I’ve already got all the kids gifts so now I can just relax and enjoy my time with the family. 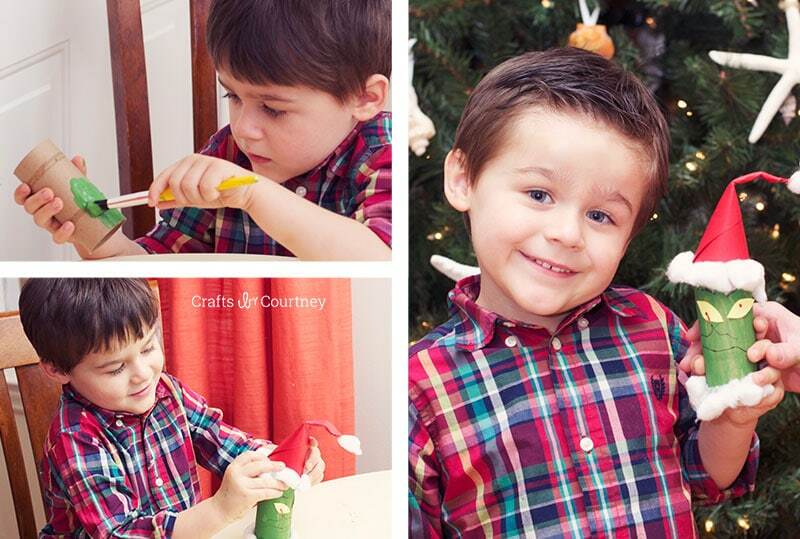 The boys are excited to see Santa and make some Christmas cookies, and of course do Christmas crafts!! 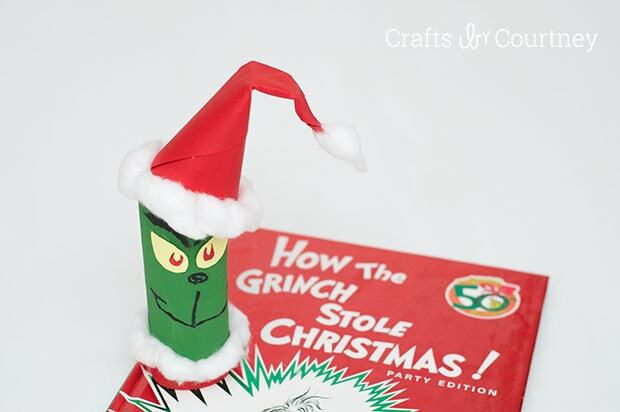 We worked on a Grinch craft this weekend. I really wanted to take good step by step pictures with the kids. BUT sometimes you just need to enjoy your time and put the camera away. Once the kids went to bed I took the step by step pictures. Here’s a couple pictures I did get of the 3 year old. We really had a great time working on our Grinch. The kids are big fans of the book and movie. So we always make sure to pull the book out every Christmas. 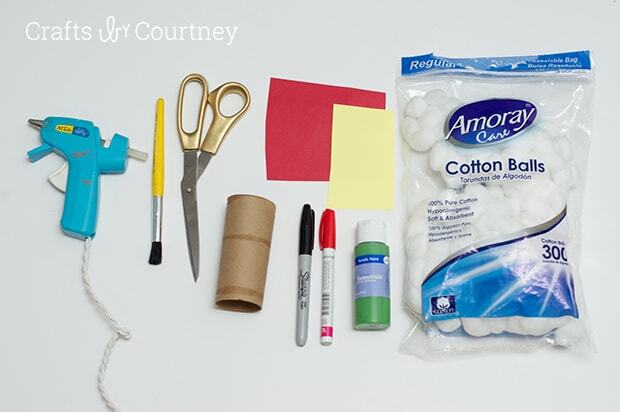 All the supplies are super easy for your Grinch. I have a huge box of toilet paper rolls on hand. I pulled all my supplies out to get started. The boys were so excited to make their very own Grinch! We painted our toilet paper rolls green first. We only needed to paint one coat, and let dry 20 minutes before adding our face. I suggest having them paint the toilet paper roll before lunch or nap. By the time lunch or nap time is over the paint will be dry! I just free handed the Grinch’s eyes and made the center red. 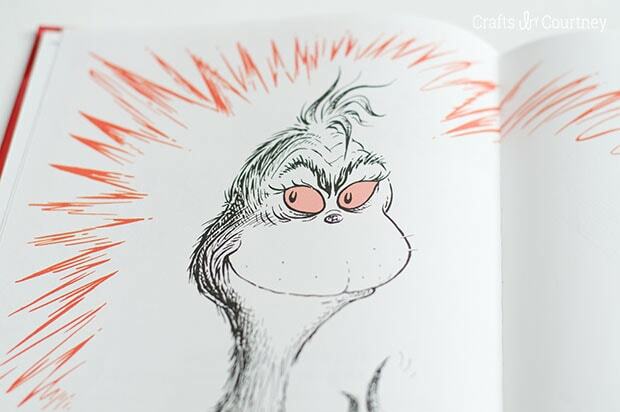 I’ve seen a couple different looks for the Grinch’s eyes. In the carton he has the yellow eyes. Now it’s time to make the hat! For the featured image I made a different hat more like the book. 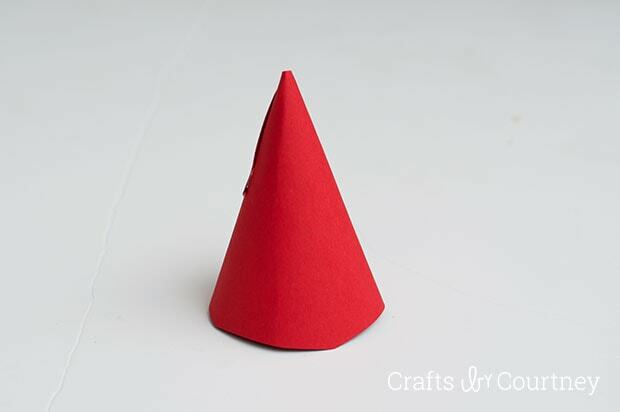 But this step will work for both, you just need to make your cone shape a lot bigger. 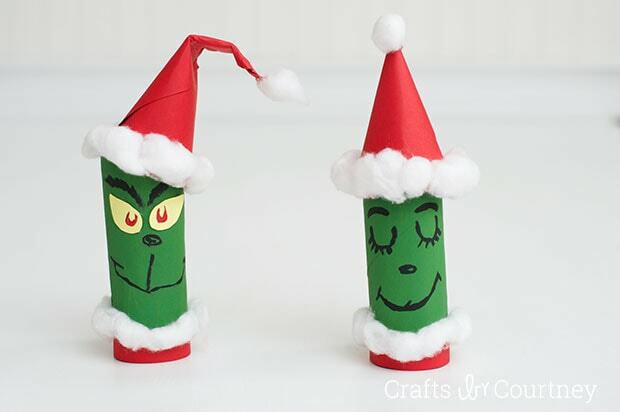 Bend the tip of the hat to the side just like the Grinch, and hot glue your cotton balls on! 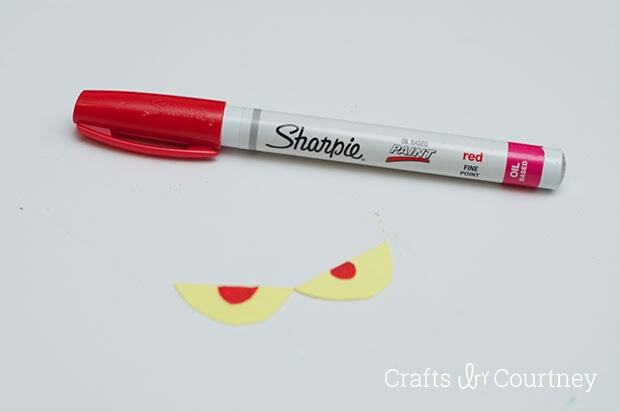 With the hot glue gun your going to need to help your little ones. I had my 6 year old do his with no problem, but did the 3 year olds hat myself. 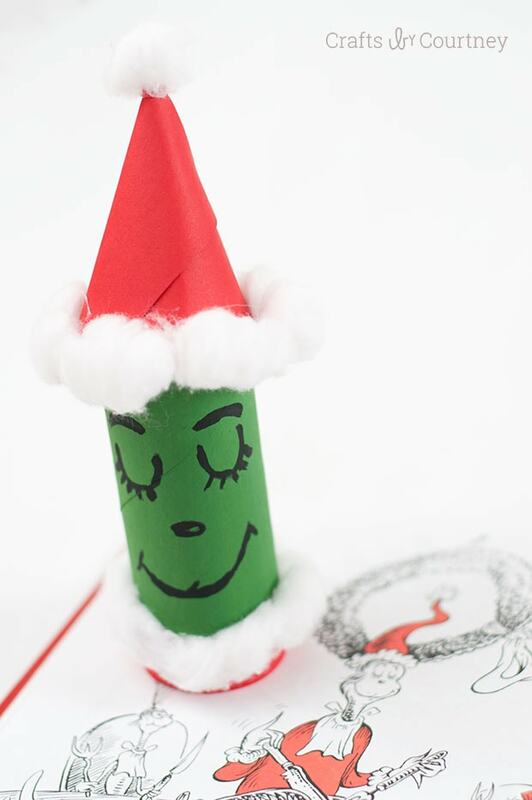 To finish off our Grinch, we painted in the eye brows, nose and mouth. 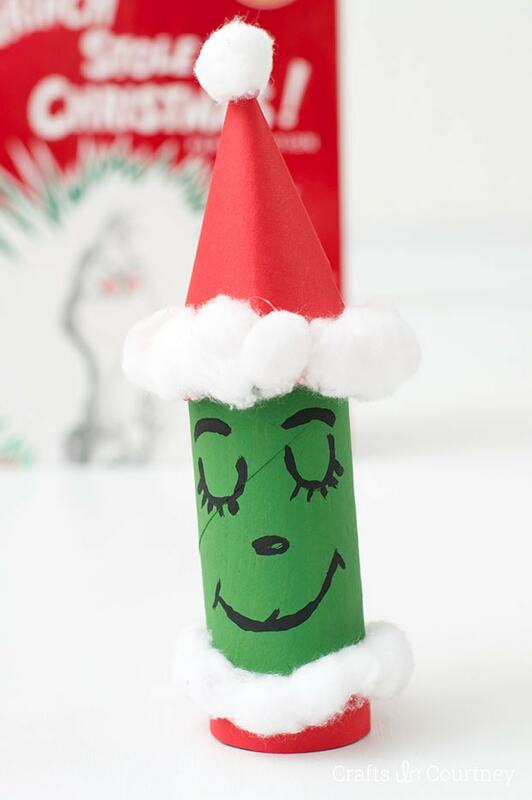 I thought the Grinch needed something “extra” so I added a little red cardstock to the bottom and some more cotton balls for Santas jacket!! Looks super cute, don’t ya think? 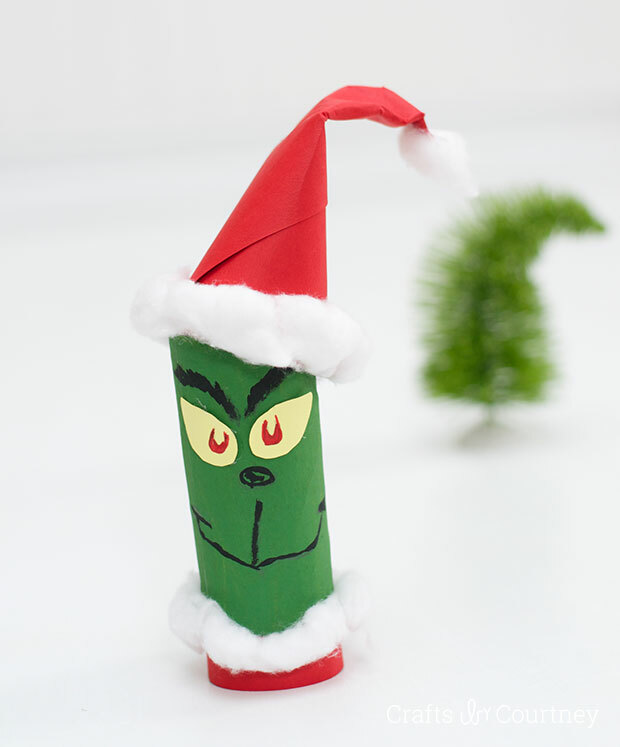 I thought since we made the naughty Grinch we would also make a nice Grinch. All I did was paint in the face for that one. See the face looks just like the one in the book. The illustrations in the book are great! I remember when I was a kid reading this story, it has always been a favorite of mine. So it’s great to be able to read it with my three boys. The little things like reading a books with your kids make great memories. 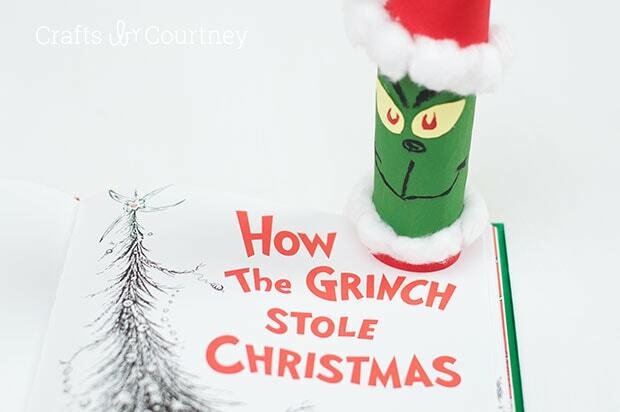 What a fun craft to make with the kids this Christmas, and make sure to pull out the book for great inspiration while making your Grinch! If your looking for another Dr. Suess craft check out the Cat in the Hat inspired hat I did!